Highfields’ talented Year 9 netball team met the best the Midlands has to offer in the sport as they took part in the prestigious County Championships. The team secured its place in the regional round of the Championships after previously being crowned Wolverhampton City winners. The 10-strong squad battled through eight games, facing teams from as far as Stratford and Herefordshire. “They braved near Arctic conditions and continued to fight on after injury and losing a key player to A&E. “They gave their all but unfortunately fell short of making it through to the national finals. Don’t worry though, we plan to be back next year! Posted on January 29, 2019 by Vicky Nash. Members of Highfields’ rugby team watched the professionals in action as part of a rewards trip to recognise their effort and commitment during the Autumn term. 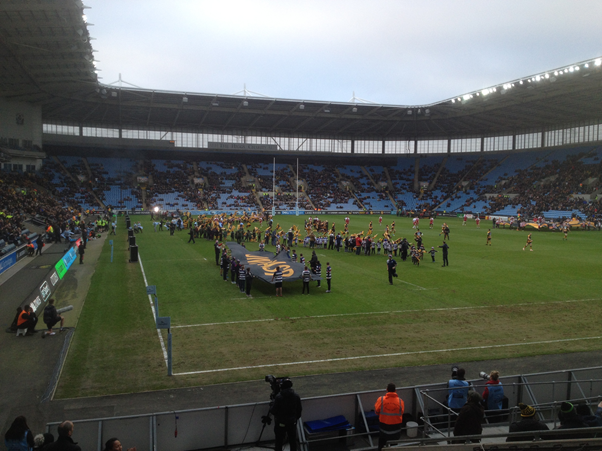 Students travelled to Ricoh Arena to watch the Premiership match between Wasps and Northampton. The Wasps’ community department provided the school with complimentary tickets so members of the team could enjoy the experience to celebrate their dedication to the sport. They were able to see a full complement of international players, including Elliot Daly, Joe Launchbury, Brad Shields, Luther Burrell, Dan Biggar, Courtney Lawes, and Tom Wood. PE teacher, Mr C Moody, said: “They watched a fantastic match which included four first class tries and Wasps winning 27-16. “The spectator environment was very different to what they had previously experienced at football, with no fan segregation. Posted on January 8, 2019 by Vicky Nash. 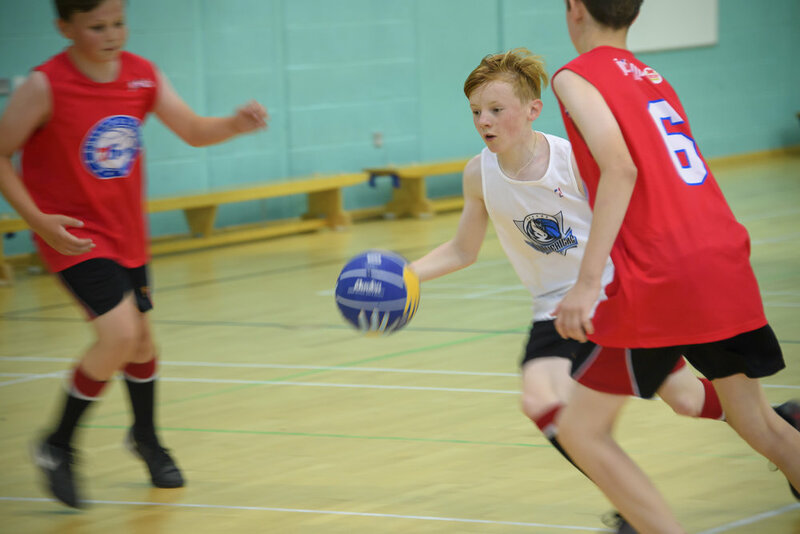 Basketball has become a huge hit at Highfields, with students now preparing to showcase their skills on the courts as part of the Junior NBA competition. The regional competition is based on the NBA, with six leagues - Northwest, Pacific, Southwest, Southeast, Central and Atlantic - each featuring five teams. The teams play fixtures in their league before qualifying for the knockout stages, with the top four teams then going through to the play-off finals. Each school plays as a professional NBA team, with kits to match. The draw was made by former NBA Hall of Famer, All Star David Robinson. Our Year 7 team will represent Utah Jazz and will play students from Moseley School, Our Lady & St Chad’s School, The Royal School and George Salter School in the group phase. Year 8 students will be playing as the Denver Nuggets. Students taking part in the tournament have been selected from basketball practice, which takes place every Wednesday night. Meanwhile, young basketball players involved in last year’s Junior NBA squad enjoyed a trip to watch Worcester Wolves vs London Lions. They watched the teams do battle on the courts in the British Basketball League at the University of Worcester Arena on November 16th. The trip was a reward for the talented students, now in Year 8, for their participation and success in last year’s Junior NBA competition in which Highfields School, representing the Philadelphia 76ers, finished first in the Atlantic Division of the Birmingham league. Posted on January 7, 2019 by Vicky Nash. Football fans will be given a once-in-a-lifetime chance to net invaluable coaching during a trip to Manchester City’s training ground. Twenty-six students will be taking part in the training weekend at Manchester City’s world class training facility. During the trip, which will take place in February, students will take part in two training sessions and take a tour of the grounds and stadium, as well as the football museum. Their weekend will be rounded off by watching the Manchester City Vs Chelsea match. Mr C Brickwood, Highfields’ Head of PE, said: “It is a wonderful opportunity for students to enjoy world-class coaching at an incredible training ground. “All of the students have taken part in at least 15 hours of extra curricular activities, so this is a fitting reward for their dedication and commitment to sport. Highfields is delighted to announce the launch of its own referee academy, giving female students the chance to start their journey to become qualified football referees. The Highfields School Football Referee Academy will be launched in 2019 with 12 girls from Years 9-12 taking part. The course is the first of its kind run by Birmingham FA, facilitated by Highfields and supported by the ConnectED partnership. It was open to all girls aged 14 and over. The successful applicants will embark on their journey to become qualified football referees and put their new skills and qualification to good use. They will be given the opportunity to take charge of all our boys’ and girls’ football fixtures, whilst also having the opportunity to apply their skills in the local community where they will be able to earn money for refereeing grassroots football matches. Talented netball players are celebrating success on the courts, with a tournament victory under their belt and two of the school’s teams qualifying for the Staffordshire County Netball Tournament for the first time. Year 9 took first place in the Wolverhampton Schools Tournament, whilst the U16s and U14s successfully made it through to the prestigious county competition to take on some of the region’s best players. Mrs J Brickwood, Highfields’ Head of Performing Arts and Assistant Head of PE, said: “For the first time ever we had two of our netball teams qualify for the South Staffordshire County Netball Tournament, meaning that we were Wolverhampton City champions in both the cup and league fixtures. “Both teams began with nervous trepidation as we were facing the best teams the Midlands had to offer. “We played our hearts out, dug deep and showed the other schools in the tournament what Highfields are made of. “We were definitely the underdogs and ‘who are they?’ was absolutely the question of the day. “Our Under 16s played with head, heart and hands. Individually, on paper, we may not have the best players but as a team we’re a force to be reckoned with. We won some, drew some and we were in it until the end. We narrowly missed out on qualifying for the next round, being beaten by The Streetly Academy in their last game with just two goals in it. What a fight and what a game. We are immensely proud of the whole team. “Our Under 14s meant business too and we were not returning home without a medal and a place in the next round. The highlight of their amazing journey was beating Wolverhampton Girls High 7-4. We drew with Streetly and were tournament runners up and silver medalists. 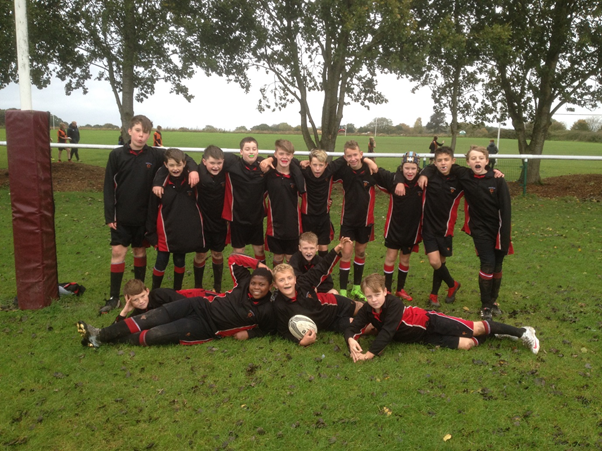 Rugby players tackled the opposition with impressive performances as part of the Staffordshire School Rugby Tournament. Highfields sent a team to take part in the U13 category of the competition, which was held at Willenhall Rugby Club. The team started the day playing our pool matches to decide the league they would play in during the afternoon. Despite some fantastic performances and victories on the pitch, a loss in the final pool game in torrential rain saw the team playing in the second league. A hard-fought draw against a talented team from St John Fisher School meant it was all down to the last game against St Francis, who had already themselves beaten St John Fisher. Mr Moody said: “St Francis knew they had to win so really stepped up their game but the team really put their bodies on the line, tackling anything that moved and stopping St Francis on the game line. Young athletes from Highfields showcased their sporting talents to secure gold in a prestigious tournament. Eight athletes from the Year 8 Boys’ Athletics Team took first prize after competing in the Black Country Schools Athletics Finals. They competed individually in 100m, 200m, 800m races, as well as in High Jump, Shot, Javelin and Long Jump events. Two teams also competed in the 2x200m relay and another two teams in the 4x100m relay. Nine schools competed in the tournament finals and Highfields’ combined points from all events on the day saw the team walk away with the overall gold medal. Mr C Brickwood, Head of PE, said: “This is a wonderful achievement. Our team put in a number of impressive individual performances to build up their points and win the tournament. Posted on June 20, 2018 by Vicky Nash. Talented netball players put on a solid display on the courts to secure bronze medal at the prestigious Black Country Games. After a fantastic season in the Year 7 netball league, the team took part in the fast-paced tournament at Aldersley Leisure Village. 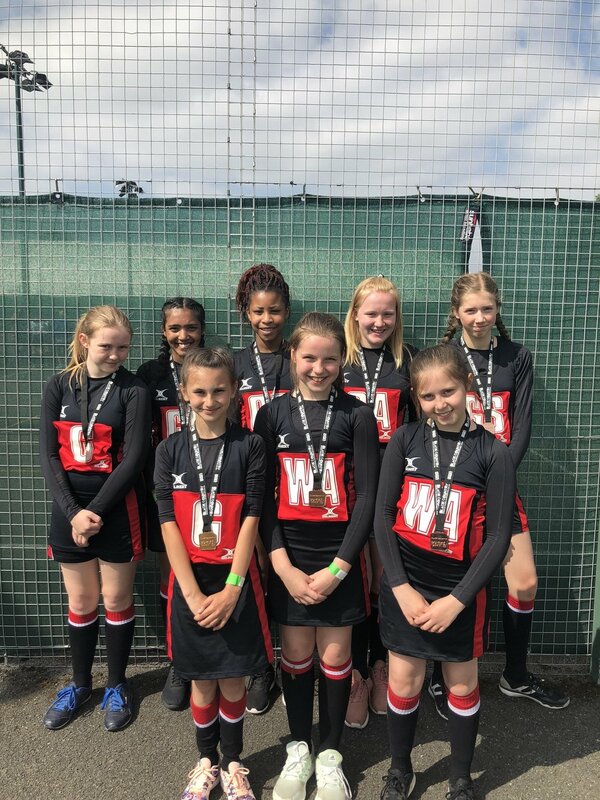 PE Teacher, Miss G Robinson, said: “The girls worked their socks off during the tournament and played a total of six games against schools from across the West Midlands; winning two, drawing two and losing the remaining two matches. “The competition was very tight and after a nail-biting wait for the results, we are very proud to announce that Highfields walked away with bronze medals. Talented athlete, Adam Saul-Braddock, has cemented his status as one of the best young runners in the country after winning gold in a prestigious national competition. Adam took the winner’s medal in the Under 17s 800m race at the English Athletics Indoor Championships. The Year 11 student secured victory with a personal best time of 1.56.13. Mr C Brickwood, Highfields’ Head of PE, said: “To win the gold medal at a competition of this level is an incredible achievement. Posted on May 3, 2018 by Vicky Nash. Talented young footballers are celebrating netting some amazing results in a successful season on the pitch. Highfields’ Year 9 & 10 Girls’ Football Team finished in the top half of the Wolverhampton Schools League, which featured 15 schools. They were then invited to compete in a ‘finals week’ tournament thanks to their league ranking, and put on a fantastic display of football. Mr C Brickwood, Highfields’ Head of PE, said: “Having stormed through the Quarter Finals with one of their most disciplined displays to date, they were held to a 0-0 draw by Girls’ High in the semi finals, so it came down to penalties to see who would move through to the final. “Despite a fabulous effort from all those who stepped up to take the penalties, and another fine display from Kathryn Smith - our goalkeeper and player of the season - sadly Highfields were beaten andGirls’ High progressed to play Our Lady and St Chad’s in the final. Posted on January 30, 2018 by Vicky Nash. A budding young judo star from Highfields put up a brave fight to secure the silver medal in a prestigious tournament. Year 9 student, Oliver Causer, competed in the Pre-Cadets (under 42 kilos) category at the Northern Home Counties Open. Wayne McDonald, Judo Development Officer at Wolverhampton University’s Institute of Sport, said: “He fought extremely well and showed great composure during the whole competition. “Unfortunately in a closely fought final which he lost he came away with a silver medal, valuable experience, ranking points and a performance that we all can be proud off. Posted on October 12, 2017 by Vicky Nash. Dodgeball players ducked and dived their way to victory to cement their place in a Black Country-wide tournament. Highfields hosted the Wolverhampton Year 7/8 Dodgeball finals where students took to the court against other city schools. The boys’ team took first place and the girls’ team finished in third. Both have now qualified to represent Wolverhampton in the Black Country Games. Posted on May 18, 2017 by Vicky Nash. Talented volleyball players are celebrating their smashing success on the court after taking third place in a prestigious competition. Members of the Year 8 volleyball team - Mia Cashmore, Georgia Derrick and India Martin - qualified to complete at the Black Country Youth Games finals after winning the Wolverhampton Schools competition. PE teacher, Ms L.Stevenson, said: “They were amazing! The team played seven schools and were only beaten by a school that plays volleyball as their main school sport. They even took a game off the eventual tournament winners. Posted on May 4, 2017 by Vicky Nash. Volleyball players from Highfields smashed it on the court to take the top spot in a tough tournament. Members of the Year 8 volleyball team - Mia Cashmore, Georgia Derrick and India Martin - won the Wolverhampton Schools competition and have now qualified to represent Highfields at the Black Country Youth Games in April. P.E Teacher, Ms L.Stevenson, said: “They played extremely well and smashed their way through the first rounds and remained undefeated until the end. “Even though, with one minute to go, they were down 13-14, they held onto their nerve and won two quick points in the last minute to win their final game 15-14. Highfields hosted a Cross Country Challenge for dozens of primary school children from the Penn area. The event is held annually at Highfields and gives pupils the chance to qualify for the Wolverhampton City Championships. Around 80 pupils took part in the challenge whilst Sixth-Form students from Highfields acted as stewards for the event. The event was staged in conjunction with the Wolverhampton Association for Sport in Primary Schools (WASPS). Students were treated to a football tournament with a fun twist as a reward for their dedication and commitment to extra-curricular sports clubs. Bubble Football made its way to Highfields to honour students' efforts in sporting activities out of school hours. The rules of the game are exactly the same as regular football but all players wear giant protective bubbles. Mr C.Brickwood, Head of PE, organised the fun treat for dozens of students from Years 7-10 as well as the school’s Sixth Form PE ambassadors. Posted on March 7, 2017 by Vicky Nash. Talented athlete, Adam Saul-Braddock, has been named among the best young runners in the country after taking bronze in a prestigious national competition. 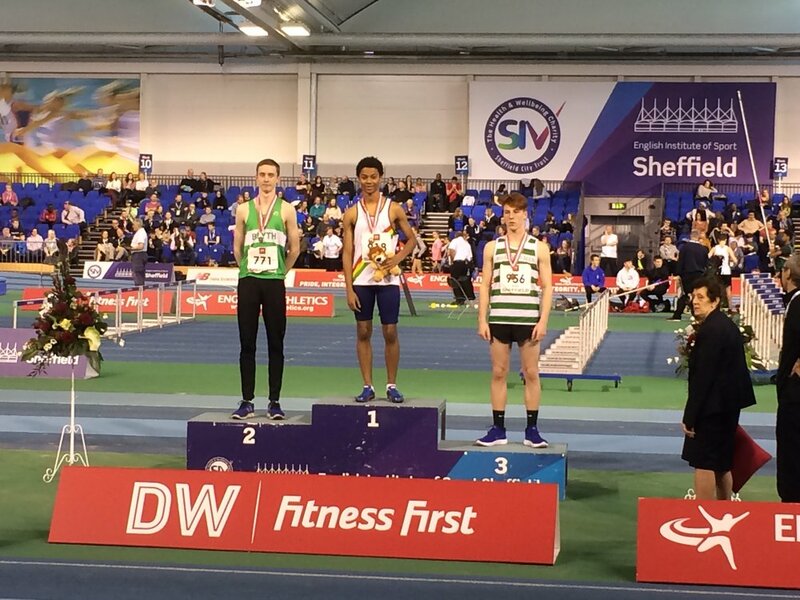 Adam Saul-Braddock won the bronze medal in the Under 17s 800m race at the English Athletics Indoor Championships, which was held at EIS Sheffield. The Year 10 student achieved a personal best of 1.57.45 to take the medal against older competitors, missing out on 2nd place by just 0.01 seconds. Mr C.Brickwood, Head of PE, said: “To win bronze at a competition of this level is an incredible achievement. He is a very talented athlete and it is great to see that he is officially recognised as one of the best runners for his age group in the whole country." Players dipped, ducked, dived and dodged when they took to the court for a fast-paced dodgeball tournament. Highfields hosted the tournament for Year 9/10 Girls’ teams from schools across Wolverhampton. Highfields' Year 10 team put on a strong performance to finish in 2nd place, beaten only by Our Lady and St Chad. The tournament was held following the huge success of Tuesday lunchtime dodgeball lessons, which have proven to be a huge hit for Highfields students. Mr C.Brickwood, Head of PE at Highfields, said: “It was a fantastic competition with some excellent individual performances. “Both our Year 9 and Year 10 teams deserve a massive round of applause. Posted on February 2, 2017 by Vicky Nash.